A flawless kicking display from George Ford led Bath to victory over Sale in a hard-fought Premiership season opener. A first-minute try by Anthony Watson helped the visitors into a 13-16 half-time lead, with centre Mark Jennings touching down for the hosts. Ford kicked his fourth penalty before Mark Easter was driven over to give Sale the lead with 15 minutes left. Ford's half-break set up Semesa Rokoduguni to cross and the fly-half added the extras and a fifth penalty. 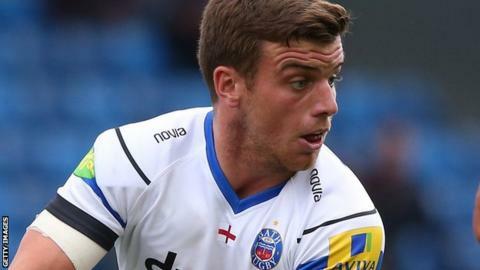 Sale did the double over Bath last season but, in his first match back after a shoulder operation in the summer, Ford guided his side to victory in a game littered with errors. The visitors got off to a dream start when winger Watson latched on to Ford's crossfield kick to touch down with just a minute on the clock, and the fly-half added the extras with the first of his seven successful shots at goal. A penalty stretched the lead to 10 before Danny Cipriani replied with three points of his own on his 100th Premiership appearance, as Bath lost second row Dominic Day to the sin-bin for the late tackle on the home fly-half that led to the penalty. Sale centre Mark Jennings crossed, either side of two more Ford penalties, and there was only three points between the sides when Cipriani added another kick just before half-time. The Sharks had chances early in the second half to take control of the match but on several occasions the final pass went adrift. Bath doubled their lead when Ford knocked over a long-range penalty before number eight Easter was driven over and Cipriani's conversion gave the hosts the lead for the first time in the match. Sale again squandered a great chance to wrap things up shortly after but the final pass to lock Michael Paterson was deemed forward. That was as good as it got for Sale, as Ford dummied his way through before linking with winger Rokoduguni, who powered his way over, with the playmaker slotting the tough conversion and adding a final late penalty to deny Sale a losing bonus point. "George Ford hadn't featured much in pre-season and I think as a team we showed a bit of rustiness. "Not necessarily George, but as a team. We had a pre-season game booked with Edinburgh and that didn't materialise. "When things happen so late, you have to adapt your plans and we basically had Bristol come in and train against us and we've had a training session with Wigan Warriors. "We adapted our pre-season but there's no substitution for actual playing and we rose to the challenge today." "Our execution and discipline let us down. The forward pass for Michael Paterson would have put it away and that was a game-breaker, but I think it was forward to be honest. "I thought there were a few areas of the scrum that didn't go our way. Our execution wasn't good and Bath deserved to win today. They were a little bit better than us in the key areas. "There was probably a bit of inexperience there in the last 10 minutes. George Ford spotted it, created the overlap and he's a top player. That was the difference really." Replacements: Arscott for Cueto (48), De Marchi for Lewis-Roberts (49), Neild for Jones (49), Miller for Cobilas (66), Harrison for Hines (66). Not Used: Lund, Cliff, Ford. Replacements: Henson for Eastmond (72), Thomas for Wilson (40), Attwood for Day (46), Fearns for Faosiliva (40). Not Used: Dunn, Auterac, Cook, Banahan.